Kitty Lee Moyer, owner of Co Motion was looking forward to the hunt herself. : "I'm a wee bit of a hunt addict. *looks at size of petite self* Erm, no pun intended." Kitty Lee Moyer: "My business partner and I make poses. I focus on poses for Petite avatars and Lindsay focuses on poses for the regular sized ones. We've both had our own shops before, but this is our first joint venture. My first shop was a tiny place where I gave away re-textured Eloh skins and hand drawn clothing. I closed my shop after a few months, because I realized everything I was making looked just awful. *lol* I have a lot of respect for people who can line up seams and make a product that makes an avatar look prettier than they did before they put them on. I started taking classes at the Builder's Brewery last year and I met Lindsay while we were looking for a very well hidden hunt gift. Once I realized I was much better at being a builder, texture and pose maker than I ever would be at making clothes I mentioned to her that I was thinking of opening a pose shop. She thought that sounded like fun, so here we are. " Kitte Lee Moyer: "A small, sandy Island with five static pose scenes, shipwreck, treasure chest, palm trees, crates, dock, ocean sounds & animated water. 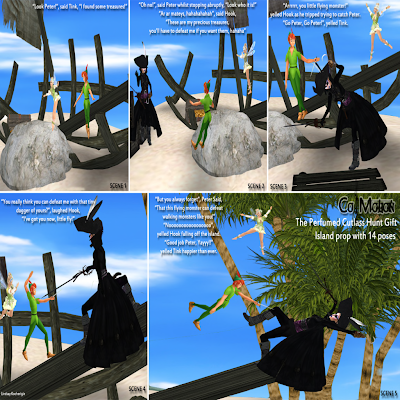 The scenes actually tell a sort-of mini story about Peter Pan, Tinkerbelle and Captain Hook. 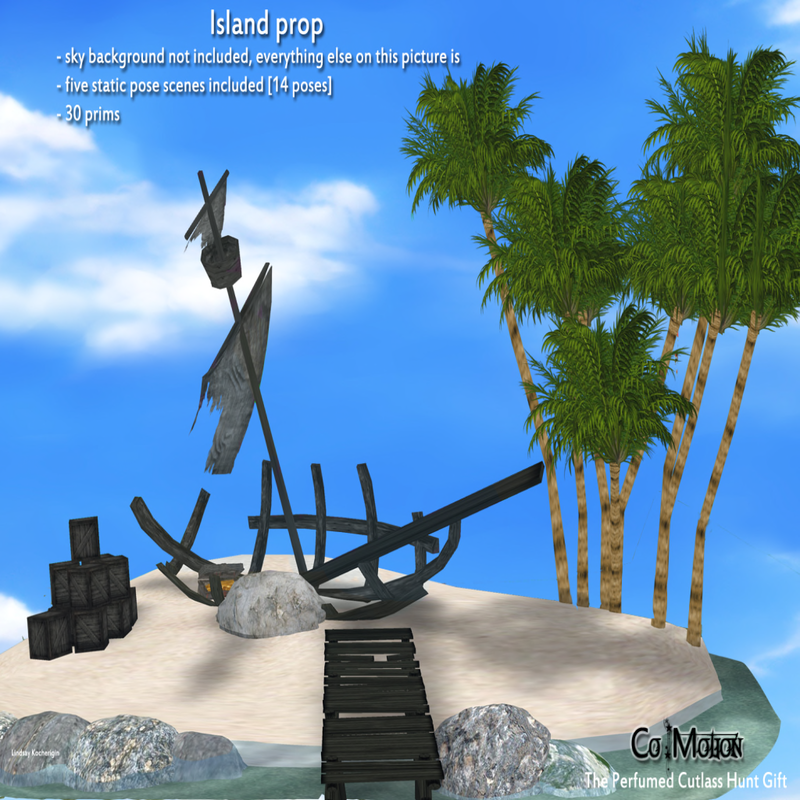 The island prop, ocean sounds & Tink poses were made by me, Kitty, and the Captain Hook & Peter poses by Lindsay."